As we traveled around the country (Teachers from NC with the Center for International Understanding), one recurring theme of discussion was the children, their freedom, and the relationship to their parents. 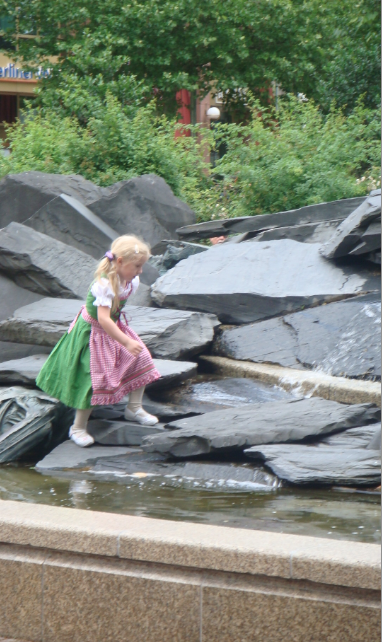 At a fountain in Berlin, I sat with my roommate Holly and watched children scamper across a jumbleof large slate rocks, with a bubbling waterfall cascading over a section. Parents set around the perimeter on a low wall: reading, chatting with friends, eating a snack. 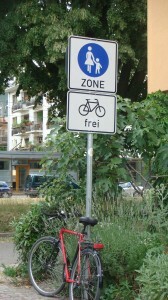 On the way back from our walk, we stopped by the same area. This time, there was a man on the rock fountain, following around a boy of nine or so, arms outstretched, as if to save him from a fall that never came. After a few minutes, we realized they were the only American family there. At dinner each night, the group would compare notes. Most babies were carried in front backs, or ensconced in raised prams, within easy reach. They were nurtured and nuzzled. 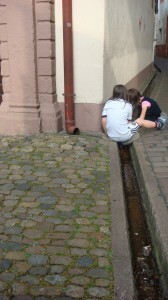 As the children grow, however, a time of play and exploration began. 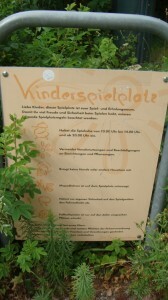 The children in the solar community played hide and seek in the green spaces or slid down incredibly fast slides. 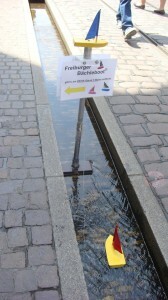 The children of Freiburg play in the Freiburg Bächle (runnels or rills - dtich-like, water-filled streams), running after origami boats, splashing, or making dams with their feet. We asked ourselves, from where did our culture of fear originate in the United States? Why, in a generation's time have we gone from a nation of children playing in the neighborhood to one of helicopter parents? Would you care to chime in with your ideas? This is an excellent question. One thing I know is that it started before 9/11. I first became aware of how hovering parents had become when my daughter was in kindergarten. We live right across from a very small, very local park and at that age I thought my daughter was old enough to play in the park by herself in the summer when I was within earshot. One day a woman who turned out to be the parent of one of my daughter's soon-to-be classmates showed up at my door, checking because she was worried that my daughter was swinging alone. It was several years before I figured out that she thought my daughter wasn't being properly supervised. I do think about this a lot, though, in part because, as a college instructor, I see the end results. The best I've been able to come up with is that helicopter parents see their children as extensions of themselves rather than as individuals, and they want everything to be fine for their children because it will somehow how reflect on them if it isn't. I've got zero evidence for any reasons, so that's the best I can come up with. I agree about some parents seeing their children as extensions of themselves. It also seems as if we are in a fearful society. I wonder if there is such a huge discrepancy between what people perceive as dangers in society and what is factual. I was fortunate to live in a tight-knit community when my children were little, so they could play in the backyard freely.